In the bible, especially in the Gospel, impossible prayers were answered. And I don't mean dying patients in ICU recovered through expensive surgery and medical procedures and medicines. Or the sick gradually getting well. These are what we call "miracles" today, but they're worlds apart from what the bible calls miracles. Jesus resurrected dead people. That's what God means by "miracles." He made the lame walk, the mute talk and the deaf hear INSTANTLY. Never gradually but always instantly. The church has departed too FAR from this definition and changed everything to mean the workings of medical science plus prayer. Or gradual cures. It's been teaching us this for decades. Looks familiar? I'm sure you were also taught thus. Problem is, I don't know where they got the idea. God answers "No"? Really? I used to believe that, but after re-thinking Scriptures, I really don't know. Did Jesus get a no answer? We're co-heirs with Christ, aren't we? And another thing--they taught us that God doesn't answer wants or desires but only our needs. So, here were the disciples, seeing Jesus walk on water. Then Peter said (or Peter prayed), "Lord, I also want to walk on water." Was that a need or a desire? (Or should I say a whim?) Would Peter die if he couldn't walk on water? Was it an urgent need? Nope. We can all live well without having to walk on water. But Jesus answered Peter's prayer with a YES. How would we answer if someone asked us about a similar request? From what we've learned from church, this is how we'd reply: "That's a silly prayer request. God won't answer it." Or, "Let's see if it's the Lord's will." It's even worse if we're praying for a dying person. We'd typically say, "Let's see what the Lord's will is. Let's be prepared and wholeheartedly accept whatever he allows to happen." Nice sounding words. To us this is according to sound doctrine. Problem is, Jesus never prayed like that. And Jesus is our model, right? We should imitate him as followers. He let Peter walk on water even if it was just Peter's whim or impulse, not an urgent need. Jesus could've said, "You don't need to walk on water. It's just your silly fancy. I need to walk on water because I have to show you I am Lord." So Peter was able to walk on water for a while. But later, he started to sink. What did Jesus do? He didn't say, "See Peter? It's not the Lord's will." We use that lame excuse when nothing happens after we pray--or if we start to "sink" or if something goes wrong. We are prone to say, "It's probably not the Lord's will" to justify WRONG PRAYER. We do that especially when the sick guy we prayed for dies. But what did Jesus say to Peter? "You, of little faith. Why did you doubt?" It wasn't a question of whether it was God's will or not. Peter sank because of his unbelief. You see, God DOES NOT answer "no." In Christ, it's always a YES [2 Corinthians 1.20]. Peter wanted to walk on water out of whim, and Jesus said a big YES. It was God's will. This should revolutionize our faith and prayer. This should stop us from saying weak, powerless and timid prayers. Nothing happens after we pray (or wrong things happen after we pray) because we pray wrongly. It's not a question whether it's God's will or not. The problem is, we doubt. Anyone who doubts shouldn't expect his prayers to be answered, said James. God wants bold prayers that declare his powerful truth. He expects us to declare his LIFE, and abundantly at that. Of course, we have to pray "according to his will." Praying thus makes everything a yes. But again, problem is, so many Christians do not know what God's will is or how to find it out. It's become a prayer formula to say, "if it's God's will." Jesus never used that phrase in his prayer. One tip he gave was, "Everything is possible to him who believes." He said EVERYTHING. It just depends if you believe. The thing is, just pray. Just ask--and the Holy Spirit takes care to fit everything to God's will. You are a son. A daughter. We ask our dads anything we desire and they give it to us, by hook or by crook. Of course, you wouldn't ask your dad things he wouldn't approve of. You know your dad. He's your dad. Well, I'm talking of an obedient kid here, not a rebellious one. A delinquent kid is another story altogether. Don't expect a yes from God if you're disobedient. That's plain common sense. Jesus is our model Son whom we should imitate as sons and daughters of God, and he always got a yes for everything he asked or desired. There's no such thing as a no answer. And we have to gear our prayers back to this. Never mind if you don't know what to ask for or how. Doesn't matter if it's just a whim, desire, want or need. Just ask. And the Holy Spirit adjusts things to fit the mind of God--He knows His mind. So don't wonder if your prayer is "according to God's will." If you are a true son or daughter, anything you ask is "according to his will." In the first place, who do you think put that idea or desire or whim in your mind? God is the one who puts that there. A true child of God naturally takes delight in Him. It should be a given, otherwise, you're not a child. Then the Father inclines your heart to his will so that what you have in mind or heart is actually his idea. There may be some details in your mind that veer off but the Holy Spirit edits everything and makes it perfect with God's will. Now, all you have to do is boldly ask it or declare it in Jesus' Name. God makes sure his obedient children get what they want or need for success. There's no "no" answer. Make sure he is really your Father and you are a genuine child. The prayer Jesus taught says, "Our Father, who is in heaven." And then it declares that "your kingdom come, your will be done on earth as it is heaven." This means your desire is to get the very will of God. When you ask for something--for anything--you want his will be done on earth as it is in heaven. Asking for someone's total healing is definitely God's will, for instance. Some people still ask if it's God's will. So they doubt. They entertain negative thoughts that question even things we clearly see in Scriptures were done by Jesus. Even the dead were raised up by Jesus--what more the sick? But this wrong prayer taught in church today makes us doubt these things and forbids us to pray bold and confident prayers. It suggests that we can never be too sure with our prayers. Our prayers have limits, it insists. The result is powerless prayers that easily succumb to the negative things we see in the physical and what doctors and medical test results say. Don't get me wrong--medicines and medical doctors and tests are all good. But they do not have the last say about our health condition and lives. God does. We have developed the BAD habit of conforming our prayers to what we see or hear in the flesh--like what happened to Peter--so we sink. We're not led by the Spirit. We're led by things of this world. It's not because it isn't God's will. It's because we doubt. Hence, so many people we pray for die. And I can hear Jesus say, "You of little faith. Why did you doubt?" We have to re-program our minds and faith big time. We have to let the Word of God dwell in us richly--and radically. I'm sure a lot of traditionally minded Christians will shake their heads on this--if not laugh or mock. But we have been deceived big time and gotten too comfortable with powerless and wrong prayers. Many times, we agree with what experts say about "incurable diseases" or hopeless disease "stages." There is NO such thing as "incurable" to God. And we have to declare this boldly and confidently, not give it half-hearted, timid, double-minded effort. I admit this is big work. I myself struggle at times because this wrong prayer has become a stronghold. But praise God I'm starting to get positive results. Real, supernatural miracles. We need to give this our best, serious efforts--because it's God's will. It's God's way. 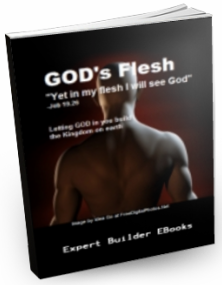 To buy the NEW AND LATEST EDITION of the e-book at a special, lower price (P200), email me at godsfleshblog@gmail.com. The e-book costs P300 plus on other blogs. Get my short emailed insights regularly when you buy the e-book through the email address above. The e-book shares radical insights about church and on genuine spiritual revival you probably haven't heard of. The Babylon church system will intensify these last days as the devil's last ditch effort to deceive believers. Intensified and yet mostly undetected. Everything seems normal. Business as usual. Yet, the "great prostitute" (Mystery Babylon) goes on committing adultery with the "kings of the earth" as she also intoxicates the "inhabitants of the earth with the wine of her adulteries," says Revelation. "Kings of the earth" doesn't just mean political rulers or presidents of countries but every influential leader--in politics, businesses, industries and churches. Especially those who act like "kings" and value being great in this world (the Nebuchadnezzar spirit)--doing everything to be great--believing that the greatest has the right to rule the least. This illusion of "being great" makes them so susceptible to the "wine of her adulteries." She makes the nations drink from her golden cup filled with "abominable things and the filth of her adulteries." What makes all this even deadlier is that "wine" and "adultery" both make you unaware of (or forget) the bad you are doing and get you "drunk" with yourself and your greatness. Adultery is having illegitimate affairs with others while being married to your spouse. Many churches in the last days will be like that--claiming to be in a personal relationship with Jesus and yet madly in love with themselves and their imagined greatness. Two-timers. And this includes one's devotion and achievements in his church denomination. They'll be so busy with these things equating them with good standing with God but then actually forsaking their relationship with him. You see this in most pastors' meeting. All they talk about is their ministries--how to grow them, their achievements so far, programs and plans, targets and goals--but no one's talking about Jesus. Well, they have what they call a short devotion, and an opening and closing prayer, but besides that it's all about their ministries. All about them. Yeah, they're all hard workers, sincere and dedicated. But they miss the only thing that matters, the better part which Mary had chosen but which Martha complained about. Meetings should be about nothing but Jesus because he promised that "when I am lifted up from the earth, I will draw all men to myself." Lifting Jesus is the key to genuine church growth. But the Babylon system keeps the church from seeing this in the same way King Zedekiah missed seeing God's prophetic warnings and fell into the hands of the king of Babylon--and fell under the Babylon system. Note that Zedekiah was a king installed by the king of Babylon. Similarly, in these last days, a lot of church pastors will be installed through the Babylon system. The result? The Babylon system easily takes over a church when believers refuse to take heed of God's prophetic warnings. The modern church today has become largely anti-prophetic and prefers practical, smart solutions, logic and motivation rather than the supernatural prophetic move of God. The Lord, the God of their ancestors, sent word to them through his messengers again and again, because he had pity on his people and on his dwelling place. 16 But they mocked God’s messengers, despised his words and scoffed at his prophets until the wrath of the Lord was aroused against his people and there was no remedy. Understandably, there are lots of fake prophetic ministries today, but that doesn't mean we stop believing in God's prophets. There are lots of fake pastors as well but we continue to seek out God's true pastors. We should do the same with God's true prophets. The Word of God will never change--God still "does nothing without revealing his plan to his servants the prophets," [Amos 3]. And the prophetic ministry of God is our only antidote against the Babylon system. This is why the Babylon system is against prophets and apostles in church and has been trying to eliminate the offices of the same. But God tells them (along with God's people) to rejoice over Mystery Babylon's impending fall. As mentioned, the antidote to the system is God's prophetic move--or God's ways in the Word. God expects his church to do everything solely in HIS ways. Anything outside his ways is Babylon system, no matter if it's been traditionally used, effective or builds churches. Remember, Jesus said every plant the Father has not planted will be pulled out by the roots. So we must do it in HIS ways alone, as found in the Word. God is angry when his people do things outside of his ways. To him, doing things in some other way exposes a stubborn, rebellious heart that is bent on disobedience. Like the observance of Holy Week, 7 Last Words Service, Easter Sunday. What's the origin of all this? Who dictates when these things should be observed every year? These are all derived from an idolatrous religion. This religion dictates when Holy Week is observed and the born-again church just follows suit. It even joins this idolatrous church in celebrating "Easter" Sunday. So with those who celebrate Valentine's and Halloween. Jesus' death and Resurrection should not be celebrated once a year. It should become part of our daily lives, especially in our daily worship. And particularly, we should not celebrate it as the idolatrous do and as they dictate. "You must not worship the LORD your God in THEIR WAY," [Deuteronomy 12]. God says in Revelation to "'Come out of her, my people,' so that you will not share in her sins, so that you will not receive any of her plagues;" We should make sure that NO trace of the Babylon system is found in the church. Anything that is sourced from idolatry is Babylon system. Remember how Nebuchadnezzar erected a gold statue of himself? That's the spirit of Babylon. Idolatry. And if you follow the traditions of an idolatrous religion, you are still under the Babylon system. In fact, anything that operates in the system becomes a home for demons. Churches run by the Babylon system is a demonic church.